"Earlier versions of this story incorrectly said that Native American activist Nathan Phillips fought in the Vietnam War. Phillips said he served in the U.S. Marines but was never deployed to Vietnam," the correction reads. Phillips was at the center of a viral video that at first appeared to show a group of Covington Catholic high schoolers, many wearing "Make America Great Again" hats, taunting Phillips near the Lincoln Memorial. Reporters and individuals on social media rushed to judgment to condemn the behavior of the boys, especially that of Nick Sandmann. 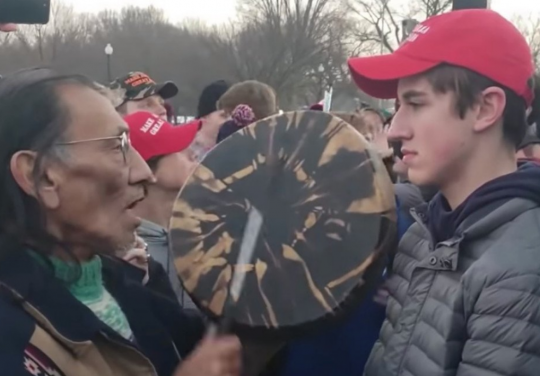 The image of Sandmann smiling a few inches away from Phillips led many to define the story as one of a privileged white teenager showing disrespect to a Native American. However, additional video and information reported in the subsequent days created a more complex picture. When the first video went viral, Phillips described himself as a Vietnam veteran in interviews with Vogue and the Detroit Free Press. Then in a CNN interview, Phillips described himself as a "Vietnam-times veteran," making it unclear whether he ever served in Vietnam. Phillips was born in 1955. U.S. Marines left Vietnam in 1971, which would have made Phillips 16 or 17 years old at the time. Phillips states he enlisted into the Marines when he was 17, making it unlikely he would have been deployed to Vietnam before the U.S. withdrawal. When it became unclear whether Phillips was ever deployed to Vietnam, news organizations began to issue corrections. The Detroit Free Press added an editor's note that said, "it is unclear if former U.S. Marine Nathan Phillips served in the Vietnam War, as originally stated in this article. The Free Press has reached out to Phillips in order to clarify that information." Vogue stealth deleted the line where it claimed Phillips fought in the war. In a 2008 interview, Phillips described how he was spit on and called a "baby killer" after "coming back to the U.S." during the Vietnam era, giving the misleading perception he fought in Vietnam. Since then, the article has been updated to reflect that Phillips is a Vietnam-era veteran. The question of his Vietnam service isn't the only subject on which Phillips has misled reporters. After the initial video of the incident at the Lincoln Memorial went viral, Phillips said the high school students surrounded him while he was peacefully demonstrating. Additional video revealed he was the one to approach the students. He also claimed the students were attacking a group of black individuals, but video shows the black individuals were part of an extremist group called the Black Hebrew Israelites and they were yelling expletive-laden taunts at the students. The students responded with chants from their school. It was during these chants that Phillips approached the students. He claims he was trying to deescalate the situation by saying a prayer and banging a drum inches away from Sandmann's face. This entry was posted in Culture and tagged Media, The Washington Post. Bookmark the permalink.